I will always respect and appreciate the will of a director/writer in trying to do something bold and bonkers. Whether thatâ€™s a divisive plot twist, a double-faced character or even an unusual method of filming, it doesnâ€™t really matter, as long as it succeeds. Steven Knight delivers a story that doesnâ€™t feel right from the get-go. Everything feels strange and random, with weird dialogues and awkward hints at something underneath it all. Then, a somewhat predictable plot twist changes pretty much everything since our perspective is entirely different now. However, it sinks the movie even more and creates a whole bunch of incongruencies and plot holes. The film wasnâ€™t near good before the twist, and it gradually transformed itself into something jaw-droppingly bad, after it. In addition to this, the final message that Steven Knight leaves the audience with, is probably one of the worst ones since The Emoji Movie. â€œDoing the wrong things for the right reasonsâ€� is always going to be a controversial statement, but in this particular case, having in mind what happens in the movie and who does it involve, itâ€™s 100% wrong and I want to believe that Knight didnâ€™t exactly want to transmit this in the way that he did. Thereâ€™s an intriguing and meaningful story to be told deep down in this messy screenplay. Behind all of the unnecessary exposition scenes (thereâ€™s no need to describe whatâ€™s happening since the twist is quite self-explanatory) and cringe-worthy dialogues, thereâ€™s a well-structured narrative and an extraordinary concept to be explored. However, I have no idea what happened to the script nor the production and filming stages of the film, but I understand now why its original release date in October was postponed to the traditional Januaryâ€™s garbage. This was supposed to be an Oscar-bait movie: an Oscar-nominated director/writer plus two Oscar-winner protagonists, in a film that seems to be more than what it actually is? I guess the production companies saw this coming and they tried to prevent an even bigger flop. Iâ€™m always the first to defend that a movie without at least â€œgoodâ€� technical attributes is rarely one of the best of the year. However, Iâ€™m also the first to affirm that if a film fails to deliver a captivating story with compelling characters, thereâ€™s no magnificent cinematography or mind-blowing special effects that can salvage it. Serenity doesnâ€™t even have that. Despite me feeling pleased that it was filmed in one-location and that the set design is pretty sweet, the editing is incredibly choppy. It feels like Knight had to remove several cuts in order to reduce the overlong runtime, which wasnâ€™t performed in the best way possible. There are a lot of moments where a character is facing a side, and in the next cut, the former is already facing a completely different one (this particular thing really occurs often). Regarding the characters, Baker and his son are definitely the ones that we learn more about since their connection is continuously addressed. Like I wrote above, thereâ€™s a relevant story behind all of this mayhem, but I did saw (even if briefly) the light at the end of this very dark tunnel. That light is instantly consumed by the darkness as new characters or subplots start to show up, and the hollowness prevails over everything else. Jeremy Strongâ€™s character is baffling ridiculous, Diane Lane (Constance) is one of the dozens of logical reasons why the twist doesnâ€™t work, but the one who annoyed me the most didnâ€™t even show up. You spend a whole movie talking about this one person, like it is going to be a crucial subplot, and then you forget about it. You merely end the film, and itâ€™s like that character was never even mentionedâ€¦ Why? Why give even more reasons for someone to leave the theater frustrated? Then, thereâ€™s the tone. Itâ€™s weird until the twist and weirder after it. Not even Matthew McConaughey or Anne Hathaway can save themselves from some awfully delivered lines. Nevertheless, itâ€™s the cast who saves this wreckage of being an F. McConaughey is a hell of an actor and he demonstrates his outstanding range throughout the runtime. Hathaway has less to do, and I felt that her lines were the worst, but I canâ€™t argue with her ability to deliver any emotion. Jason Clarke (Frank Zariakas) is perfect as the violent father/husband, and Djimon Hounsou (Duke) has some space to shine. 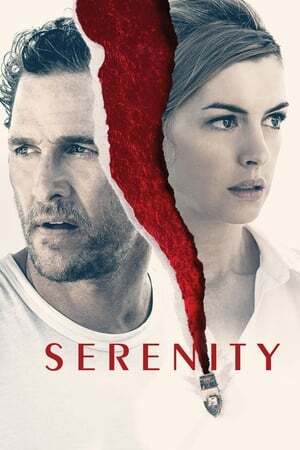 In the end, Serenity tries to go big and bold, but falls astonishingly flat. Plot holes, logical incongruencies, awful dialogues, terrible editing, hollow characters, and neglected subplots. Steven Knight had a great concept and a truly interesting thriller-mystery in his mind, but his execution is shockingly baffling, and the twist transforms everything into something way worse. The final message is the number one reason why I donâ€™t recommend anyone to see this movie, especially if you take teens or kids with you. Matthew McConaughey is good enough to avoid a total disaster, and I know that there was something incredible behind all of this horrible mess. Itâ€™s probably going to end up as one of the worst films of 2019, unless we have a truly disastrous year in cinema.